Get ready for another season of RVing in style? 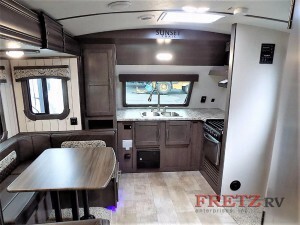 Check out the features that the Sunset Trail Super Lite travel trailer here at Fretz RV comes equipped with! The Sunset Trail name has long been known as a flagship name for CrossRoads RV, and for good reason! 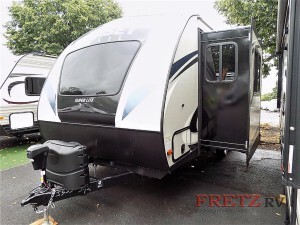 This tried-and-true travel trailer never fails to provide families with a memorable and comfortable experience when on the road; and the new models here at Fretz are no different! Want to know why these Sunset Trail Super Lite travel trailer floorplans makes for a great time on the road? Check out some of our favorite features for yourself. Check out the CrossRoads RV Sunset Trail Super Lite. With an airy, sophisticated feel, you will love relaxing inside the Sunset Trail Super Lite, no matter if you are in the woods or by the Ocean. Comfortable seating arrangements make the most out of any stop and the luxurious dinette makes eating dinner both relaxing and manageable. The CrossRoads RV Sunset Trail Super Lite Interior. This RV comes with many awesome floorplans to choose from, all of which feature a camping friendly layout that make relaxing more enjoyable. Spacious floor space means you won’t have to climb over anything or anyone to get to your favorite chair, plus an array of features that are sure to please campers of all ages. The kitchen in all of the floorplans is set up to make cooking not a chore, but a delight! Plenty of counter space and cabinet space means that you can prepare anything that you would at home, and have more than enough space to keep all of your favorite ingredients. There are a lot of reasons to love the Sunset Trail Super Lite travel trailer. If you want to see some more of them for yourself, you should come by to see which Sunset Trail Super Lite travel trailers we currently have in stock. Or, as always, contact us to get all of the information.